Brunch is one of my favorite meals. 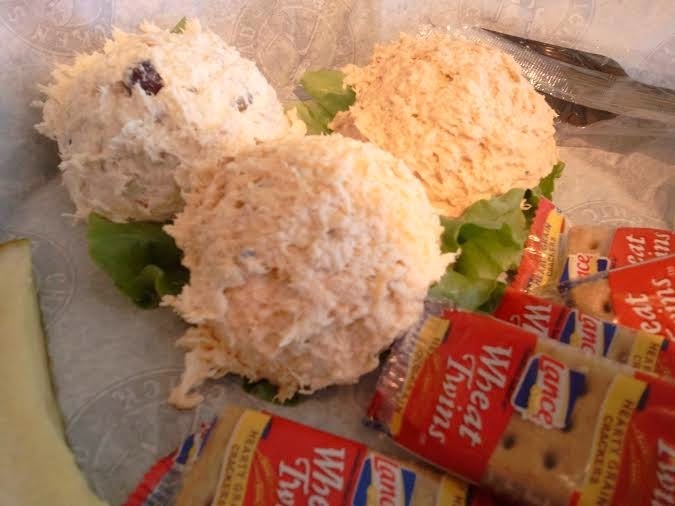 It's that meal between breakfast and lunch that can be a substitute for both. 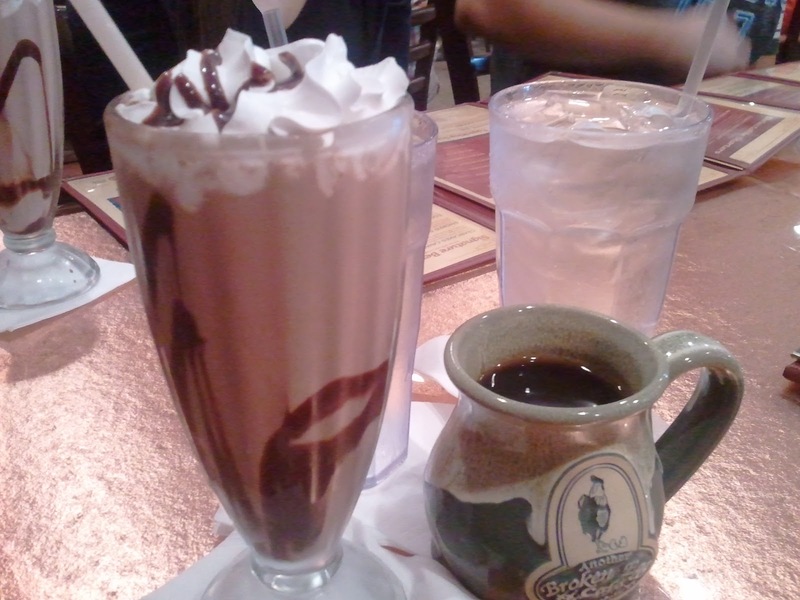 Another Broken Egg Cafe may be one of the few places in Pensacola that serves up brunch. I've heard about ABE from a few friends and they seemed impressed by it. I couldn't wait to try it out because I am one of those people that have to taste to believe. My friend ordered the baked brie as an appetizer. 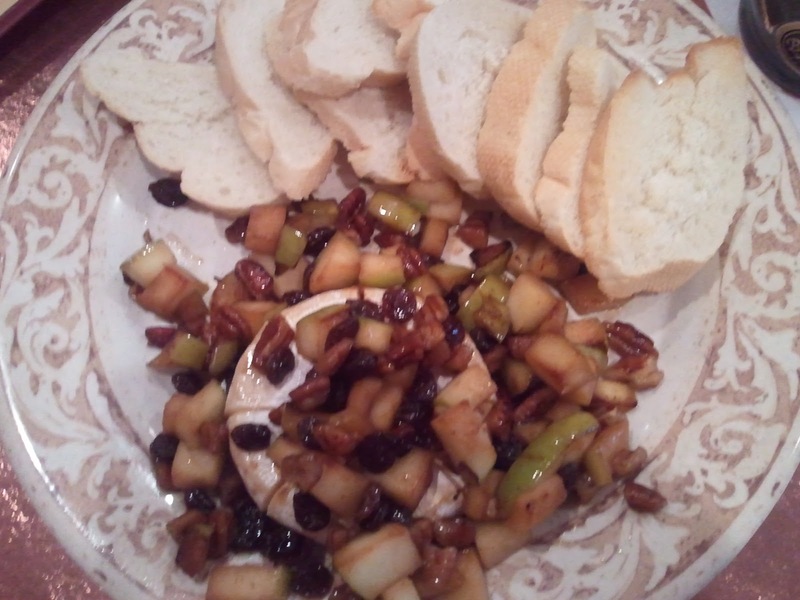 It's a relatively small round of brie topped with a mix of green apples, raisins, and pecans with a slightly sweet butter sauce. It's served with 8 or so slices of lightly toasted bagettes. I could have used a little more bread. The green apples still had a bite to it and added a bit of sourness. My older brother, who hates brie, actually liked the appetizer. I thought at $11 though, it's was a little overpriced. I ordered the smoked salmon benny. It's ABE's version of the classic bagel and lox. It starts with a lightly toasted bagel then cream cheese, smoked salmon, topped with two poached eggs, capers and diced red onions. 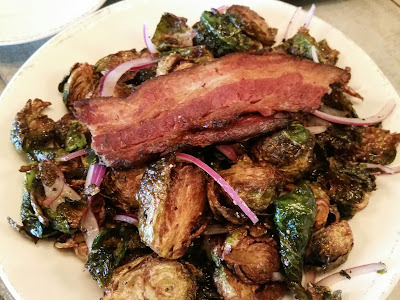 It's served alongside some country fried potatoes. I really enjoyed the dish. The smoked salmon is so tasty. It's rich and salty. I cut into the poached egg so the yolk will drizzle down and kind of make a sauce. It really helps with what could be a dry bagel. I love what the capers and red onions added to the dish too. 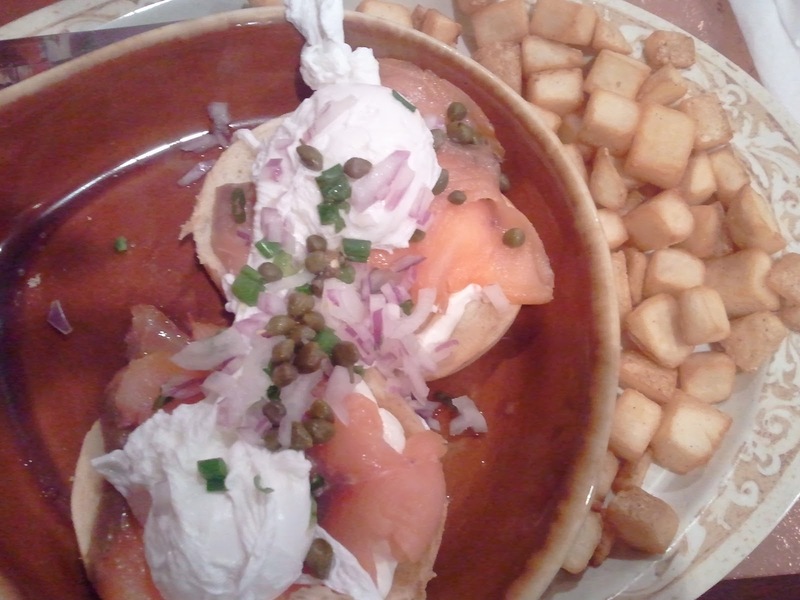 The capers have a little sourness that cuts the richness of the salmon and eggs. The red onions give it a bite. Did I mention the egg was perfectly poached? Well, it was. The country fried potatoes were crispy on the outside and fluffy and soft on the inside. However, it need some salt, pepper.. something! The potatoes was just a little bland for me. The rest of my group ordered omelettes. The two guys went for Stan's #1. It's crawfish, shrimp, mushrooms, and ham with Cajun seasonings and melted Jack and Cheddar cheese. Omelettes are served with country-fried potatoes and english muffin. My brother opted for some white toast instead. Of the 4 that got omelettes, only 1 person actually like hers. My brother thought his omelette needed something more. The most disappointing thing was the shrimp was not fresh gulf shrimp. It was so rubbery and you can tell the shrimp has been frozen and defrosted. I don't understand why a restaurant wouldn't take advantage of the fresh shrimp available nearly outside the restaurant's backdoor. 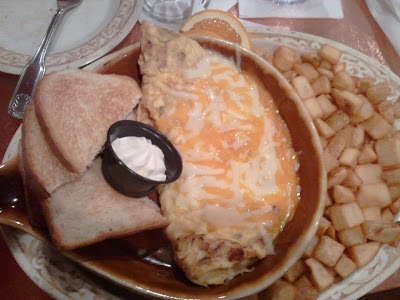 The other guy who got the Stan's went digging through his omelette to get to the meat. He didn't find very much. The couple that I went with has gone to ABE before and enjoyed the Belgium waffles. She asked if I would like to share an order and I, of course, agreed. 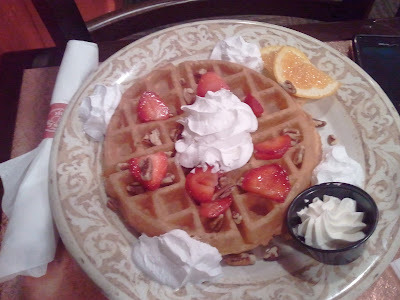 She ordered the Belgium waffle with pecans, strawberries and whipped cream. I am going to be honest. I think the waffles I get at Waffle House may be better. It's soft almost like a pancake. The batter is slightly sweet but I needed a little syrup which was nowhere to be found. What I found absolutely ridiculous is the price! The Belgium waffles plain start at $7. Each addition is $1.49. Really?!?! That was about two strawberries and six pecans chopped for $3. Highway robbery, I tell ya. I won't be ordering this the next time. 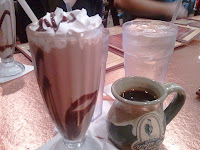 The same friend spoke highly of the chocolate milk. I thought it would be something special. It's not. It is more rich than what you make at home but I don't think it's worth $2.49. I thought it was very telling when our waiter came to our table to introduce himself and my friends are like "oh god." Apparently, service is not consistent at ABE. My friends has been there twice and had two different experiences. This guy apparently forgot about them for the majority of their visit the last time. This time, he was a little better. He did put in two orders slightly wrong but it wasn't deal breakers. ABE is a franchise and the owner came into our dining room. He stopped at several tables but skip ours and spoke to the table directly behind us. I would have liked to be greeted by the owner and asked how my experience was. It's the personal touches that elevates a patron's experience to the next level and cultivate a relationship that could mean recommendations to family and friends. I am on the fence about ABE. My food was good but the rest of my party didn't quite enjoyed theirs as much. Some items were definitely not worth the price. To check out ABE's website, click here. Prices for brunch starts at about $10. ABE also serves sandwiches and salads that starts at about $8.